Frugal vegans are extreme couponers. 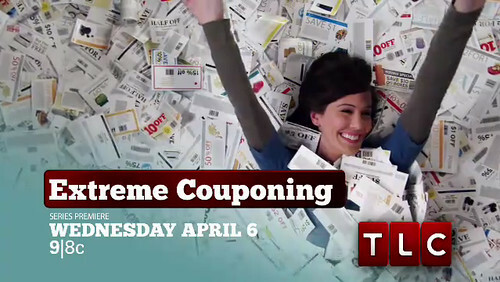 Okay, so maybe not as extreme as the women and men featured on TLC’s strangely addictive new show Extreme Couponing (it’s all fun and games…until someone uses their store credit to buy meat!) – that would require a commitment equal to a part-time job – so let’s just say “serious about free money,” mkay? Because that’s exactly what coupons are: money. Hopefully free, but at the very least cheap, as in pennies on the dollar. Unfortunately, coupons for vegan foods – particularly intentionally vegan items, such as Tofurky pizzas and Follow Your Heart cheese, and fresh, whole foods like fruits and veggies – can be hard to come by. Not impossible, but certainly more difficult than, say, Dannon Yogurt freebies. But. With a little craftiness and a bit more patience, it is possible to score a discount on vegan goods! Ask. Really, it’s that simple! Write to your favorite manufacturers; explain to them that you’re a vegan on a budget who would love to try items xyz, but are hesitant to shell out so much money for a new foodstuff that you may or may not like, and would they be so kind as to send you a few coupons? Don’t be afraid to pour on the sugar! If coupons are to be had – and they aren’t always; you’ll find that smaller, newer companies don’t usually offer coupons – you will have them (usually in six to eight weeks). If you’re especially lucky (and charming! ), the company may even send you vouchers for free items. As in you pay zip, zilch, nada, nothing. Go dumpster diving for coupons. Take a trip to your nearest recycling center or paper recycling bin (Paper Retriever is a popular one ’round these parts) and dive in! Look for newspapers and inserts, but don’t make a mess. (Etiquette, y’all.) Load up your car, backpack or bicycle basket to go and sort through the coupons at home. When you’re done, save time, gas and trees by recycling the unwanted paper on your next dumpster diving expedition. It’s a win-win! Join a group discount website. Speaking of Groupon, group discount websites like Living Social, VeganCuts and the aforementioned Groupon offer deeply discounted rates on all sorts of items and activities. Sure, 90% of the deals involve spas and dating services, but every once in a while you’ll find a rare gem, like free shipping on Nacho Mom’s Vegan Queso, $20 worth of Whole Foods groceries for $10, or half off vegan marshmallows from Sweet & Sara. And VeganCuts, as the name implies, is all vegan – no gross summer sausage deals here – so you should definitely go show ’em some love! Subscribe to your favorite store’s e-newsletter. Stores routinely offer incentives to subscribe to their email lists, such as a first look at new, discounted and/or discontinued items, coupon codes entitling customers to a percentage off an entire order, or free shipping – vegan retailers included! (Vegan Essentials comes to mind.) If you don’t mind receiving a little extra email in your inbox, this can be a relatively simple way to hunt for savings (let them come to you!). If your store offers a discount “loyalty” card, take it. Commonly, these cards shave a percentage off your order, or entitle you to extra savings on sale items. If you’re deterred by privacy concerns, you may consider purchasing more “private” items separately, without using the card. Keep an eye out for coupons while shopping. Sometimes manufacturers affix coupons directly onto their corresponding items, or include books of tear-off coupons on displays. Always be on the lookout for these (vegan) Easter eggs! Join a coupon swapping community. This one can be tricky for vegans – I tend to shred coupons for non-vegan items, rather than share them – but if you’re down, there are plenty of coupon swapping websites and forums online. Search for “coupon swap” on Yahoo Groups or Google to get started. Or, better yet, start your own vegan coupon swapping community! Maybe on VegWeb or the PPK forums? No need to compromise your ethics to score a deal! Updated to add: Over on tumblr, Emelda tipped me off to Recyclebank, which allows users to earn points for doing good deeds; these points are then redeemable for various rewards, including – wait for it! – coupons! If you do, sign up using this link so she gets ten free points! Well, (semi-)extreme couponers, it’s your turn! What do you do to save money on vegan foods and items? This entry was posted on Monday, October 17th, 2011 at 12:20 pm. You can follow any responses to this entry through the RSS 2.0 feed. You can leave a response, or trackback from your own site. You are SO right about the just asking part. I couldn’t believe how many coupons I got from Amy’s Kitchen, Follow Your Heart, Whole Soy, Seventh Generation and so many more by simply emailing their “contact me” person and asking! And the store discount card is such a saver too. Our Kroger has nondairy milks on sale constantly, partnered with the coupons I get in their “newsletters” and I usually only pay $1.50 for them! I’m going to have to look into VeganCuts though, didn’t know about that one!! Thanks! I shop for specialty vegan food at places like Marshalls, Big Lots, and Ollies. The off-price stores seem to get a lot of specialty shelf-stable stuff because, I imagine, it’s more expensive than other foods. I have found all sorts of things including Bob’s Red Mill products, Peeled Snacks, Coconut Sugar, etc. @ Jen – Yes! If I have time, I’d like to photograph a shopping trip to Big Lots or the Dollar Store to highlight some of the vegan goodies they carry. The Dollar Store is especially useful for the dinnerware and placemats I use in all my food photography. Goodwill too. Why would the vegan on Extreme Couponing buy Country Time Lemonade when its made with non-vegan sugar? She also bought Frenches Mustard which also isn’t Vegan…..